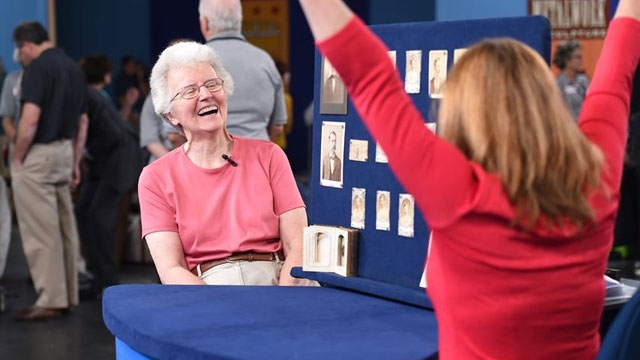 ANTIQUES ROADSHOW hits a home run on January 5 in the premiere of Season 19 with a treasure-filled visit to New York City and its largest sports memorabilia find ever! Then, the first of three hours from Austin premieres January 26! Your audiences can find out the value of a spinning wheel gifted by Mahatma Gandhi. ANTIQUES ROADSHOW hits a homerun in the premiere of season 19 with atreasure-filled visit to New York City and its largest sports memorabilia find ever!Mark L. Walberg and appraiser Eric Silver take a trip to the New-York HistoricalSociety to discuss Frèdèric Auguste Bartholdi Statue of Liberty statuettes.Highlights include: an unpublished Art Spiegelman book proposal, ca. 1974 thatwas positioned to become a sequel to his quotation book Whole Grains; aheadboard from the set of The Godfather, Part II that was purchased for under$25; and an archive of rare photographic baseball cards with a handwritten letterfrom the 1871-1872 Boston Red Stockings, appraised at $1,000,000. ANTIQUES ROADSHOW is in The Big Apple for the first time in 13 years,where host Mark L. Walberg heads to an iconic venue, The Apollo Theater, for aROADSHOW’s Most Wanted segment. Highlights include: a Tiffany Studiosmosaic inkwell, ca. 1905, likely designed by Carol Driscoll; a show run from theBeatles’ first The Ed Sullivan Show appearance along with an autographedphotograph of the band; and a Joseph Kleitsch oil painting, ca.1925, purchased bythe owner’s father from Kleitsch’s widow for $100 and now valued at $500,000. ANTIQUES ROADSHOW stops in NYC where host Mark L. Walberg joinsappraiser Nicholas M. Dawes at the Salmagundi Club to learn about porcelainmugs created by former artist members. Highlights include: a Tiffany presentationwatch that was gifted to NYPD lieutenant Giuseppe Petrosino by the Italiangovernment; a 1943 Irving Berlin manuscript that was discovered nestled in the pages of a photo album belonging to the family of the Columbia Recordspresident; and a collection of rare 1903 American Beauty-backed tobacco baseballcards in pristine condition, appraised for $200,000. ANTIQUES ROADSHOW marks its 10th trip to Texas with a stop in Austin,where host Mark L. Walberg and appraiser Laura Woolley travel to the BriscoeCenter to talk about a personal collection donated by country music legend WillieNelson. Highlights include: a spinning wheel gifted to the owner’s mother by Mahatma Gandhi, now valued at for $50,000 to $75,000; a pin designed by popartist Roy Lichtenstein that features his trademark Ben-Day dot pattern; and adiamond and platinum Van Cleef and Arpels necklace that was custom orderedfor $5,700 by the owner’s father-in-law and is now worth $125,000. ANTIQUES ROADSHOW is in Austin, Texas where host Mark L. Walberg joinsappraiser Wes Cowan at the Texas State Library and Archives to learn aboutfraudulent and authentic Texas Declaration of Independence documents. Highlights include: a 1607 Galileo letter that was purchased by the owner’s grandmother for $170 and is now appraised at $60,000 to $100,000; a jewelrycollection of a diamond and sapphire ring, a necklace, and a tassel, valued at$55,000 to $85,000; and a Chinese cloisonné panel that was said to be gifted to the owner’s grandfather by the Emperor of China and holds an estimated auction value of $70,000 to $100,000. ANTIQUES ROADSHOW stops in Austin, where host Mark L. Walberg joinsappraiser Bruce M. Shackelford at a private collection to learn about antiqueMexican saddles. Highlights include: a scrapbook of World War II photos from the owner’s grandfather-in-law who was one of the “Monuments Men”; an 1875“Pictorial St. Louis" atlas including birds-eye maps of the entire city, drafted in ahot air balloon; and an inherited jade ring and case made around 1930 whose impressive size and rich green color give it its value of $60,000 to $80,000.